Can you imagine anything more alluring than the sweet scents and comforts of a rustic lodge with a toasty dry, facilities equipped, clubhouse after a damp and chilly morning in the field? The chance to get out of wet socks, dive into a warm cup of coffee and the smell of logs smoldering in the fireplace. Add to the mix a hot bowl of soup, heaping pulled pork sandwich, the camaraderie of your hunting buddies - all weaving tales about the morning hunt - and you have a pretty appealing scenario. Now for the let down. As enticing as this may sound, some of the amenities that hunt clubs offer are offset by the way the grounds are groomed for a “gentleman’s hunt”. Many of them over-treat, mow, replant, groom and mow some more. Most cut wide paths so the walking gentleman or senior citizen can move freely through the field. I have even heard it once said that "I, for one, don’t want get my $600 boots wet!" There are easy drives and access roads, paths, ruts, food plots (usually in the form of sorghum strips) that dice and cut all over the field. I imagine an aerial view of the grounds would resemble that of a checker board. The over-treatment of fields creates what I call a sterile field. There exists little or no under growth, the young immature growth that does exist repels moisture and thus repels scent spores. To the fleet footed bird just granted their under ground pass on the pheasant highway to freedom, it is a welcome development. When they make it to the nearest path, access road, ditch bank, etc... they have crossed the boarder to freedom. 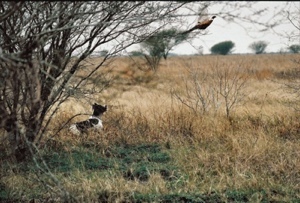 Free from the most cunning of dogs, the highest choked nose cannot recover a fleet footed pheasant on the pheasant express. 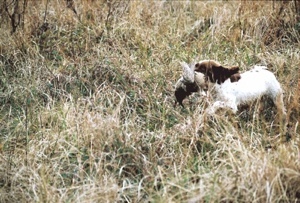 The bird gaining access to the pheasant express leaves in its wake one frustrated dog and one embarrassed handler. The exception to the rule is the genetic defect or the sleeping bird. This is the bird that decides to sit tight and hide. Perhaps they will pass me by if I am still and I can shut down my scent glands. Or I will play the run and hook game, trying to stay one step ahead without facing the prospect of the great unknown that exists at the end of the pheasant highway. Nature has a way of culling these genetic defects from the herd. The lazy, unambitious bird rarely is saved to pass their genes on to future generations. And that is good. 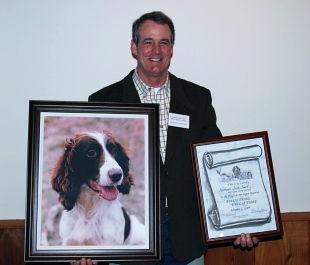 "If you have been to some of our hunt club field trials you have experienced this... perhaps time and time again. They are not competitive events; they become survival tests. They reward the last dog standing." If you have been to some of our hunt club field trials you have experienced this... perhaps time and time again. They are not competitive events; they become survival tests. They reward the last dog standing. If you go often enough and long enough, there is a real good chance that you will have your turn as the last dog standing and be awarded the blue ribbon. Let me say that it is all good! Trialing is just not for the highly competitive personality. It is for all of us. Hunters and dog fanciers alike. But the event itself is meant to be competitive. The very nature of the field trial is to find the best dog. We have all heard the axiom "the best dog that day" used when conditions are poor and only few dogs get through. More than once, I have heard of judges opting not to award all the ribbons - and even a case where they awarded three while with holding the "blue" because they did not feel any performance warranted a blue ribbon. Don’t kid yourself, when conditions are very poor, you will probably have the best dogs sitting in their crates. What does this all have to do with lodges and club houses? I personally think of them as a necessary evil. Nice to have but often time paralyzing clubs from securing superior, natural cover to host their trials. The clubhouse becomes more like a cloud that stifles the field trial committee. It is a warm place that provides shelter from the storm. 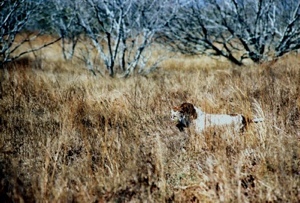 The hunt club set up will almost always be the easiest way to conduct a field trial. The convenience and familiarity minimizes logistics and simplifies the staging steps of the event. It's a no brainer! The irony in it to me is that like that pheasant who takes the safe course, hunkers down and fails to run, playing it safe, playing shuck and hide... Mother Nature will catch up to you. In the case of poor grounds, word will get out, numbers will decline and entry fees will dry up. Once thing I can tell you is that the typical hunt club trial will never have to institute a policy to control high entries! A word about great hunt club trials - and they are out there. There are clubs with ample land and natural cover. One example that comes to mind is the Fatino Hunt Club in Illinois. They have long huge fields of natural cover. Unmarred by paths, rows, access roads and heavy-maintenance practices. They are surrounded by CRP land and local area crops providing more than ample food sources to hold birds - wild and pen raised - in the vicinity. The point is this: there are good grounds out there. If your club is operating with inferior grounds, organize some search parties, keep notes, keep an open eye, ask questions and knock on some doors. If you have good grounds, cherish and nurture them. Be sure that the landowners or managers know how much you appreciate the use. If you don't know the difference, or you don't want to be bothered, give the job to someone who does. Our Green Book talks about the best cover being a broken cover or uneven. Parts that would challenge a dog and parts that would make for good viewing of the dog. Cover that is uniformly too tall is never good simply because the handler and judge can't see what is going on. Too little cover doesn't hold birds and penalizes the dogs that come up in the order at the far end or after a delay of any kind. Striking a relationship with a land owner who has nice fields can sometimes get the best results. Invite them to your banquets, meetings and send them gifts. Pay them for the use of their land, if necessary. At a recent trial in beautiful cover, I witnessed the land owner returning the check at the banquet when he heard of all the other donated services and fund raising efforts. There is nothing like the warm fuzzy feeling when it comes to giving! State owned and public owned properties can work out great, as well. You must maintain contact with the offices and be sure to get things in writing. It is not unusual to hear that the field set aside for the trial was just mowed. It is, however, usually followed by "well, no one checked in with them since the spring!" These things take work, effort and scouting parties. They carry with them the risk that perhaps you will lose your grounds down the road with a change in ownership or new division manager. It does, however, yield the best grounds we have today. Look at Tennessee, for example. Several of our Midwest Nationals have been run on state grounds, as well. The best cover I've witnessed is almost always privately owned or state owned. The worst is almost always a hunt club. It is a hard sell to get a committee to move from a hunt club. Everything is usually right there: ATV’s, birds, planters, storage, clubhouse, facilities, etc... It is easy to do. Absent will be the congratulations for putting on great event. Missing will be the high entries that go hand in hand with our best run trials, non-existent will be a strong field of competitive dogs. Gone will be runners taken off to the side and dogs recovering long wing-tipped retrieves. These two items will be replaced by runaway birds and lenient judging... maybe. Most handlers would rather stand drenched in a cold rain, huddled up beneath a shaky tent, desperately sipping at a cup of coffee, fading fast, but running in long fields of superior quality broken cover knowing that the dogs are in conditions where they can strut their stuff. They would take these six days a week and twice on Sunday over the cozy clubhouse complete with a couch and crackling fire to warm your feet by - if it comes with the sub-par cover that hunt clubs often provide.